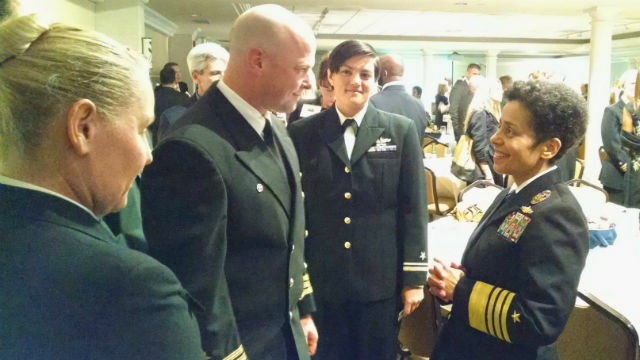 The Navy’s second in command and the first African-American woman to become a four-star admiral told local defense leaders that San Diego has emerged as the Navy’s hometown. Howard spoke at the 8th annual achievement awards presented by the San Diego Military Advisory Council, a nonprofit that supports the common interests of the military and the defense community. She called the SDMAC organization a “shining example” of how San Diego welcomes the Navy. “What a special place this is, and what a special relationship we have,” she said. During her welcoming speech before the awards ceremony at Naval Base Pt. Loma, Howard detailed how the relationship has grown over the more than a century of time since a coaling station was first established in San Diego. The Colorado native graduated from the U.S. Naval Academy in 1982 and went on to command the USS Rushmore, becoming the first African-American woman to command a Navy ship. Howard helped hand out the awards, which recognize civilian and military individuals, companies and organizations that have made extraordinary contributions to the welfare of San Diego’s military community in the preceding year. Peter F. Hedley received the first Rear Adm. Bruce Boland Award for Lifetime Achievement. Hedley, who retired as a captain after a 27-year career, went on to become a successful businessman while also devoting himself to service in the San Diego community. Hedley is a past president of the Pacific Life Holiday Bowl, the Fleet Week Foundation and SDMAC. The crew of the USS Essex for volunteering at educational and athletic events at two San Diego elementary schools, helping clean up beaches and parks, and supporting local charities. Lt. j.g. Janet Von Eiff who since 2011 has volunteered her off-duty time as the assistant coach of the women’s varsity basketball team at Montgomery High School, creating a positive role model for young women. The Marine Corps for support in combating the May 2014 San Diego wildfires. The San Diego Chargers for their annual “Salute to the Military” and “Salute to Service” games, as well as providing tickets to active-duty military and their families and cash donations to veterans charities. The Coronado Rotary Club for its 2014 Low Tide Ride and Stride event that raised more than $72,000 for a number of veterans charities.